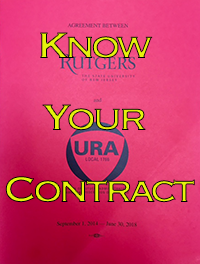 The URA Bargaining team met with Rutgers’ Management team for three bargaining sessions in September 2018, bringing the total number of sessions to 13 overall since April 2018. Tentative agreements were reached on Article 38 (Safety Committee) and Article 47 (Union‐Employer Information Exchange). No new written proposals were exchanged with either side, but counterproposals were exchanged on Article 12 (Dining Services). Union members presented personal testimonies to proposals including: Bereavement Leave, Employees Living on Campus, and Dining Services. URA steward and subject expert Karen White from the Center for Women and Work at SMLR joined the team for a detailed discussion of management’s proposal on FMLA and other legal leave provisions. 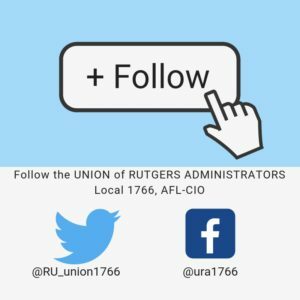 The URA’s information request to Rutgers management providing evidence of how Rutgers has administered FMLA/NJFLA/NJSAFE leave is still outstanding. Why so much talk about FMLA and Sick Leave? URA and our coalition partners are emphasizing protection for our FMLA and Sick Leave rights. Over 10 years, we have observed that Rutgers does NOT give equal treatment or provide clear guidelines on how to administer these legal protections. Now, we are bargaining to establish clear, fair and workable contract language to protect our members who face health challenges. If Rutgers really believes in employee wellness, as it claims to, we believe that a win‐win agreement can be found. Don’t be fooled by Vivian Fernandez’s emails touting recent agreements with unions and their offer of 3% raises to the Teamsters and even some non‐aligned employees. You need to know that the Teamsters Local 97 only represents 1,700 employees in legacy UMDNJ titles and the Fraternal Order of Police Local 164, approximately 43 superior officers. Our URA‐AFT 1766 represents 2,500 employees. The Teamsters’ agreement says nothing about health insurance costs. How much of their increase will be eaten up by health care contributions? They don’t know. The Teamsters’ agreement does not protect their members’ jobs from massive privatization—Barchi and Strom are giving Rutgers’ clinical operations around the state to Barnabas Health…where Teamster jobs will be replaced by RWJ‐Barnabas workers. The Teamsters agreed to language that will limit their rights to sick leave and FMLA/NJFLA protection. (See description of URA bargaining above.) Their FMLA will be charged concurrently with sick time (a major crisis could put one’s job in jeopardy much faster than the benefits URA‐AFT members have now). 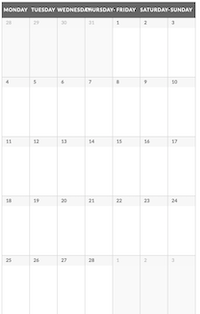 The Fraternal Order of Police Local 164 agreement is retroactive to July 1, 2014 and runs out June 30, 2019 – meaning they will be back at the bargaining table in less than a year! Finally, non‐aligned staff (Managerial, Professional, Supervisory and Confidential employees) have been “given” 3% for this year, but still don’t know how much their healthcare contributions will be…AND, they have no job security at all. They are “at‐will employees” and can be fired at any time, for any reason. Vivian Fernandez’s emails are calculated to persuade you to be disgruntled about and question the value of your union membership, in general, and tempt you into becoming impatient with unfinished contract negotiations involving YOUR own union. Watch this video to see what union members are doing to ensure we negotiate a strong contract, not a meaningless sweetheart deal, that will benefit YOU as a URA member. Between noon and 1 PM on October 4 members from all the unions on campus will be gathering in front of the Camden Campus Center, 326 Penn St., Camden, NJ for a speak out session. At 1:30 PM we will speak to the Board of Governors to insist that contract be settled inside the campus center.